Anyone who knows me, knows that one of my biggest passions (besides classic movies and music) is cooking and baking. I’m big on making baked goods and meals from scratch. Perhaps it’s the Merry Homemaker-1950’s Housewife that lurks deep in my soul, but I love spending hours in the kitchen. Really. I’m not too big on pre-packaged items, except for frozen pizzas (because everyone has their guilty pleasures, right?). My specialties are various lasagnas, risotto, cinnamon raisin bread, and fruit pies with crumb topping. I’m not bragging (really! ), I just love to cook. My mom taught me when I was a kid and as I grew older, I just kind of ran off with it. I’m really thankful for her teaching me the basics. But enough about me. 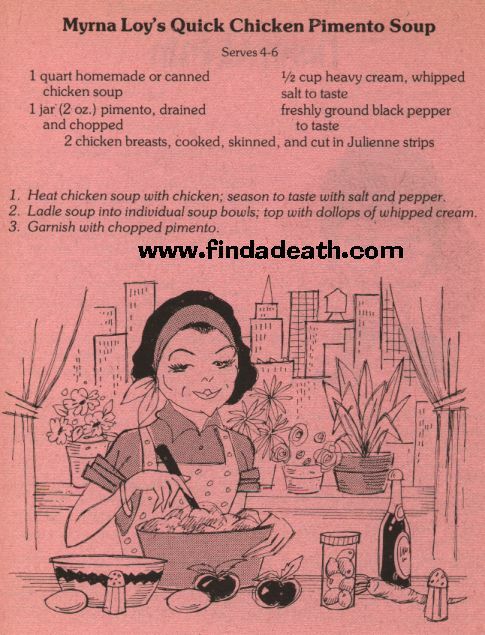 Since I do a bit of research for upcoming posts (stop looking at me like that), awhile back I stumbled upon two soup recipes from Fred Astaire and Myrna Loy off the…Find-A-Death site. Yeah, that’s great, isn’t it? It really makes you want to try them out. In all honesty, I was looking up the mysterious death of Albert Dekker (which is really, really messed up), saw the link for Fred Astaire’s page and wound up searching the site for the next hour or so. I love getting sidetracked! Fred and Myrna: Culinary Experts! Both the Fred and Myrna soup recipes seem to have come from some kind of celebrity soup book that had to be published in the 70’s. 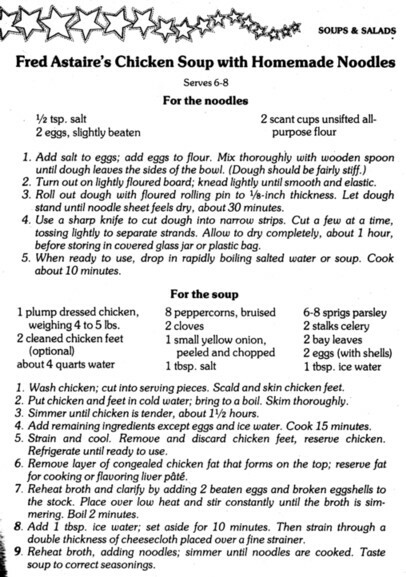 Mr. Astaire’s recipe is somewhat reminiscent of the soup and homemade noodles my mom taught me to make (minus the chicken feet–I once saw those in an international supermarket and nearly ran screaming out of the place), but you can tell that Myrna was an “open the can and heat it up” kind of gal. I asked Fred Astaire fanatic (I wouldn’t hesitate in calling her his number 1 fan! ), Chris, where the recipe came from. Apparently it popped up in Parade or some sort of 70’s news magazine and it’s his mother’s recipe. It makes sense, because it’s pretty old fashioned and my mom got hers from her mother (my grandmother). It’s kind of complicated though, and I’ve now learned how to make mine in a pressure cooker. It eliminates the hours needed to boil, boil, boil the chicken and skim, skim, skim the froth off the top of the liquid. In other fun classic cooking news, I happened to find this mid-40’s ad proclaiming Mrs. Damon Runyon’s love for Swift Frankfurt’s. Although after reading the small print, I’m not sure if I’d really enjoy a night at the Runyon household, no matter how much I enjoyed A Slight Case of Murder (1938) or The Big Street (1942). Perhaps meal planning was different in the 40’s? I can think of nothing more disgusting than a meal consisting of hot dogs, citrus salad and butterscotch pudding. And let’s not even mention the creamed carrots in onion cups! Did people really eat like this in the WWII era? Can you imagine the stomach indigestion and heartburn from that combination? But then, I like Turkey and Peanut Butter sandwiches on Rye, so who am I to complain?